As the Marine Operations Supervisor, Hank oversees all aspects of the sanctuary’s mooring buoy program. The program maintains a system of more than 808 regulatory markers and mooring buoys located throughout the sanctuary’s 2900 square nautical mile boundary. A North Carolina native, Hank came to the Keys in 1992 and joined the Florida Keys staff in 1999. Hank is a USCG captain, and operates the sanctuary program’s research vessels for mooring buoy, damage assessment and maritime heritage field operations. A diver (PADI Asst. instructor) since 1993, Hank became a NOAA working diver in 1999 completing NOAA’s dive training program for use of underwater tools, hydraulic equipment, and safe dive operation oversight. Hank was one among 4 sanctuary staff who represented the U.S. government’s marine protected area managers traveling to Columbia in 2003. The delegation was sent to assist the Columbian government’s marine protected area managers in the use of equipment and regulatory marker installation. 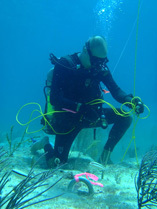 Hank’s familiarization with the marine environment, coral reefs and benthic habitats coupled with his training, use of equipment and sense of oceanography has made him a most valuable member of the Florida Keys National Marine Sanctuary staff.